I recently acquired a vintage egg-shaped cake pan, made by Nordic Ware, and was dying to use it this Easter. The biggest question? Which recipe to use. My new Essential New York Times Cookbook, a labor of love (and talent!) by Amanda Hesser, has an intriguing recipe for a carrot cake that promises to be "light as cotton." Carrot cake - of the dense variety - is a huge favorite around here, so I thought I'd give the fluffy version a try. The cake's full name is Maria Tillman Jackson Roger's Carrot Cake, and with that moniker it just had to be great! - You can find the recipe here, and, great news, it includes weight measurements as well as volume (the cookbook recipes are in volume only). Hesser made one change when she included the cake in the cookbook - she doubled the amount of cream cheese in the frosting while keeping all of the other ingredients the same. You end up with more frosting volume, and it is creamier and less sweet. - The recipe yields three 9-inch cake layers. I was too lazy to measure the capacity of my egg pans, and, eyeballing it, decided to make half recipe of the cake. It turns out that the egg cake pans are bigger than they look, and the cake halves didn't rise all the way to the rims as they baked. As a result, my finished egg is a bit flat. I'm betting that 2/3 recipe would have been perfect, meaning that each of the two half eggs is equivalent to a 9" round layer. - As I was frosting the cake I realized that I had not thought through a decoration plan for my Easter egg cake. Plain cream cheese frosting is fine for a layer cake, but a spiffy Easter egg should be a bit more festive. It was late at night, though, and I wasn't up to the challenge of tinting, piping, sprinkling or anything else. 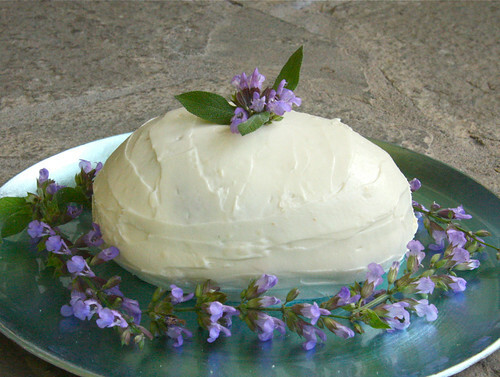 So on Easter morning I scattered some flowers from my herb garden over the cake platter and called it done. While I'm not sure I'd call my cake "light as cotton," it had a moist, even crumb that was not the least bit heavy. There was none of the usual spice and added ingredients that are endemic to carrot cakes, but the chopped pecans gave a welcome textural boost. My daughter thought it was not carrot cake-y enough, and my husband thought it "could use a bit more spice but was superb otherwise." For the next time, I'd probably add some cinnamon and nutmeg to the cake batter, and a pinch more sugar to the frosting. 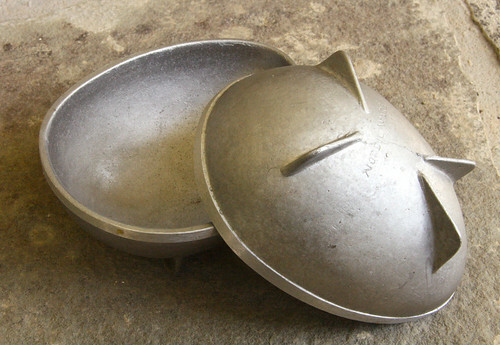 I love the vintage egg pan...very cool.....hope you had a lovely easter with your family. You always have the neatest baking tools in your arsenal! I love the vintage egg pan. And, I think a light and fluffy carrot cake sounds fabulous. I think I'd like to try this recipe, but I'll definitely take your advice regarding the spices. The slice of cake looks just lovely with the orange flecks of carrots scattered about. Happy Easter, Nancy! Very festive! I like the flowers as decoration. I don't make carrot cake often, but this sounds like a good one. What a neat pan! 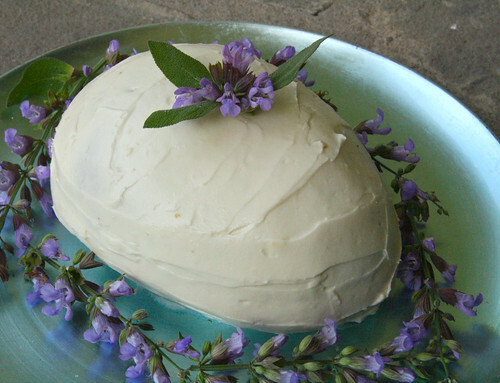 The cake is perfect for Easter, and I love the way you decorated it with the flowers from the herb garden. Oh, it all looks just beautiful, the outside and the inside. The flower decorations are so very elegant and gorgeous...simple and perfect the way you used them to decorate. Love the pan! Here is where we usually have the vintage lamb cake pan. This egg pan is way cool. I haven't seen one like it. 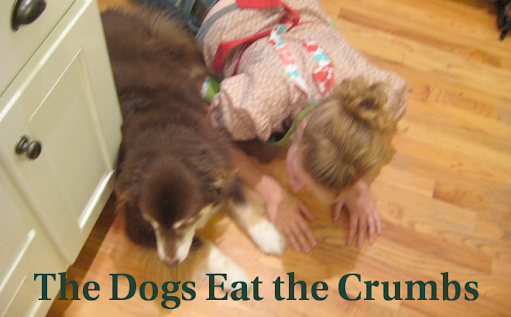 I am a huge fan of carrot cake and so I always on the look out for another. The one I use mostly has toasted walnut oil. Anyway, lovely how your cake looks so nice for Easter. Wish I could taste it, I'll just have to make it. Thanks for sharing. Ciao ! 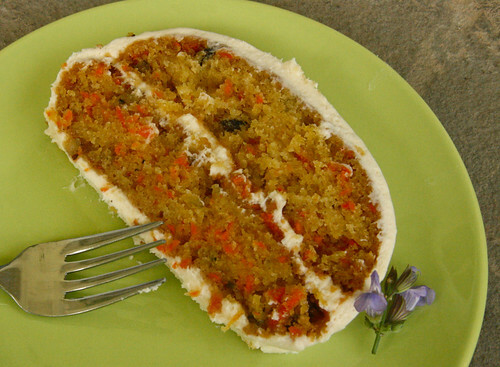 I love your ovoid carrot cake ! Did you use sage flowers ? Mine are blossoming too ! I think I would go with your suggestions of adding more spice to make it more like the carrot cakes we love! It does sound like a version I would love to try! That egg pan is fabulous! Love the flowers...they make the perfect decoration. The cake looks tasty, too!